Ganesha was the son of the Hindu god Shiva and his wife, Parvati. Shiva cut off Ganesha's head in a fit of anger because the boy wouldn't let him see Parvati. He later relented and restored him with the head of the first thing he saw—an elephant. Statues of Ganesha are placed in the entryway of Hindu temples where supplicants propitiate him upon entering. Known as the Lord of Obstacles, Ganesha both removes obstructions to success as well as generates them, and he is often invoked upon beginning an endeavor. Here, in keeping with typical Javanese portrayals, he is depicted seated with his feet pressed together. 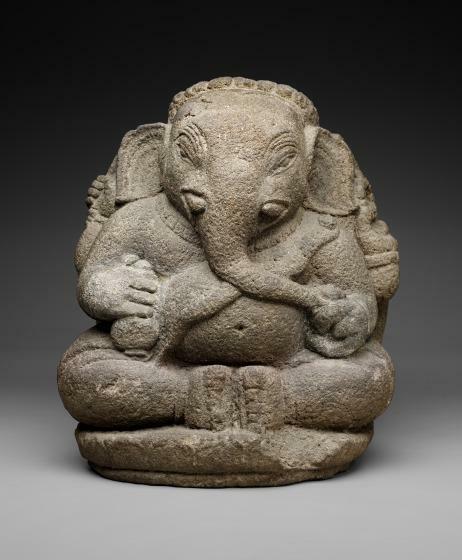 Nancy Tingley, "Ganesha," in The Arts of India, South East Asia, and the Himalayas, Anne R. Bromberg (Dallas: Dallas Museum of Art; New Haven: Yale University Press, 2013), 247.